Today the group climbed Gangilonga to watch the sun rise, prepared for site visits, and had dinner with University of Iringa students and friends from St. Paul Partners. 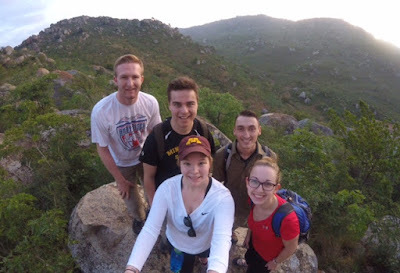 This morning all of us got up early to climb Gangilonga, a local outcropping overlooking the surrounding area and watched the sun rise over the hills. On the way, we had to hike through what we assume to be an old German watchtower that is now in ruins. During breakfast, a few of the girls went into the back courtyard and found kittens in the bushes. The women who work for the Lutheran Center came with a broom to help us catch them. After the morning excitement, we broke out into our village teams to further prepare for our site visits. The teams worked with their EES programs to better understand how they can be applied to optimize a future design. When the lecture was finished, there was free time until lunch. 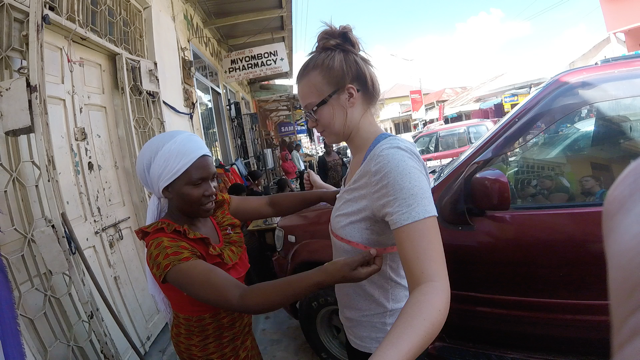 A group of us went back to the market to find fabric to get custom made kitenges, a local style of clothing. We took our fabric to a seamstress who knew very little English. Between our crash course in Swahili, animated hand gestures, and the handy Google translate app we successfully had shirts tailored. Kathy arrived in the late morning and after relaxing from her long journey, she joined us for a lecture presentation by Byemerwa, a regional water engineer. He presented on the process of designing a well that is able to run using solar energy which greatly depends on the sun peak hours of the day. We also talked about the importance of understanding the village needs which includes where the people are located, how they are currently getting water, and how we can help them improve their water obtainment. Three students from the University of Iringa and our friends from St. Paul Partners joined us at the Lutheran Center for dinner. The students each study community development and one will be travelling with each group to the villages to help us interact with the residents of the village and aid in translating. We are excited to continue our adventure and learn more about how the pump designs become implemented tomorrow as we travel to the village Lutingilo.